Ending it with rivalry weekend was a great way to cap off the 2009 College Football regular season. As the conference championships loom and Boise State awaits getting robbed, we're wrapping up. The Case For Boise The 12-0 Broncos have a single game remaining, win big or win tight and it won't matter. The BCS has already determined that no game on their schedule can vault them ahead of where they've been (6) for four consecutive weeks. Then why do I think they deserve a shot at a BCS bowl game? It's simple. You can't keep 'em out. They boast a victory (v. Oregon) of a team which will be receiving an automatic BCS bowl berth as the PAC-10 regular season champion. No team has been more consistently powerful than Boise, scoring 40 points or more in each of their last six games and in 9 of their last 12. In the most recent BCS Rankings, no team in the top 10 has a win over any other team in this top 10, except Boise State & Ohio State. 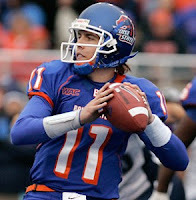 Led by Heisman hopeful Kellen Moore, whose play has been nothing short of amazing (38 TD's, 3 INT's), the Broncos are the nations most underrated team and deserve a shot to prove it. Ho Hum, Texas, Florida, & 'Bama Win The Longhorns got a scare, surviving to get a 10-point win at College Station. 'Bama needed a late fourth quarter drive to win in Auburn, 26-21. Finally, the Gators ran it up on Florida State early and often. What does this mean? Exactly what we thought, you'll see two of these teams in the BCS National Championship game, if you don't, we're in trouble! The Crimson Tide and Gators are in a great spot, one team from the SEC will be playing for the National Championship. However, if the Longhorns were some how to blow the Big 12 Championship, all hell would break loose. Wouldn't Boise deserve a piece of the National Championship game? Wouldn't TCU deserve to get in there? Wouldn't a 1-loss SEC runner-up deserve another shot? Wouldn't an undefeated Cincinnati team stake claim? We may have already pre-determined the Big 12 Champion if undefeated gets a title shot, but does the same go for the Big East? For supporters of some sort of playoff system, this has to be what your rooting for, complete chaos. With that said, Go Cornhuskers! If Nebraska would win, they'd be headed to a BCS game right? Which would leave someone out, you can bet on that causing some issues. Would the Fiesta Bowl really pass on Boise State for a 1-loss Texas team? If you want chaos, you've got to keep eyes on the Texas Longhorns. When Irish Eyes Are Crying All is not well in South Bend. 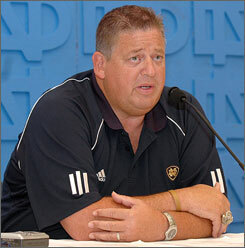 A canceled West Coast recruiting trip for Charlie Weis after a fourth straight loss. Rumours of his firing are more than swirling, the Irish faithful await NFL decisions on quarterback Jimmy Clausen and receiver Golden Tate. After a 6-6 season, all six losses by seven points or less, the Notre Dame brass will be forced to make a decision very quickly. Three straight unacceptable finishes for Charlie Weis and a fan base of alumni and non-alumni screaming for his job, would you be able to game plan with all that surrounding you? I'm going to defend Weis for a moment. He's a very good offensive coach, the ninth ranked offense in all of college football proves that. An offense which has scored 30 points per game and averaged 45 yards + per game has been nothing short of outstanding this season. He can recruit and coach up. Jimmy Clausen is the perfect example. Here's a kid who will most likely be playing Sundays next season after being drafted in the top 5. Clausen has thrown 28 touchdown passes and just four interceptions. A top 10 quarterback in yards per attempt, total yards, and completion percentage. When Clausen told reporters this Saturday "I wouldn't be at Notre Dame if it wasn't for Charlie," someone should take notice. No way Tate & Clausen don't jump to the NFL if Weis goes, new coach won't come out and get you to a BCS game in 2010, too much work will have to be done. Get over it Notre Dame, you just aren't that great any longer. Rudy would have went to Gainesville! (1) Toby Gerhart, RB Stanford No player made a better final push. Gerhart turned in his 3rd 200+ yard performance on Saturday which included adding 3 more rushing touchdowns. Ending the regular season as the nations leader in rushing yards and rushing touchdowns. (2) Colt McCoy, QB Texas McCoy gets it. Finish the season stronger than you start. The Texas quarterback threw 10 touchdowns in his final three outings going interception free. Heading into the Big 12 Championship Colt McCoy is as sharp as he's been. (3) C.J. Spiller, RB Clemson You can only ignore C.J. Spiller's Heisman candidacy for so long. 7 Rushing touchdowns, 4 receiving touchdowns, and 4 kick returns for a touchdown. As Clemson made their final push toward the ACC Championship, Spiller racked up three performances of over 100 all purpose yards. He's THE game changer! (4) Mark Ingram, RB Alabama The frontrunner for much of a lackluster Heisman race, Ingram has averaged 6.46 yards per carry in a great season. 'Bama's top weapon has picked big games to have his best; 150 yards v. Virginia Tech, 172 v. Ole' Miss, 246 v. South Carolina, 144 v. LSU, and 149 against Mississippi State. (5) Tim Tebow, QB Florida Say what you want about his numbers in 2009, Tim Tebow is the heart & soul of the nations top football program. His final performance in Gainesville was throwback Tim Tebow; 17 of 21 for 221 yards and three touchdowns. Vintage Tebow also racked up 90 rushing yards and two rushing touchdowns on Saturday afternoon. Not a fan of sports except for college basketball; but I have to say great design; i.e topical bullet-list, concise yet still a draw.